My daughter turned seven last week and requested a mermaid themed pool party. While color schemes, garland and paper pom poms are an important part of a birthday bash, in our home the craft station is usually a large focus as well. My kids love arts and crafts time, and so I wanted to come up with something that would be a hybrid of things that we all loved, with some attention to design. My goal was not to create more clutter for the kids to bring home, but to help them all create something sweet and simple that they would hopefully be able to display at home for awhile. 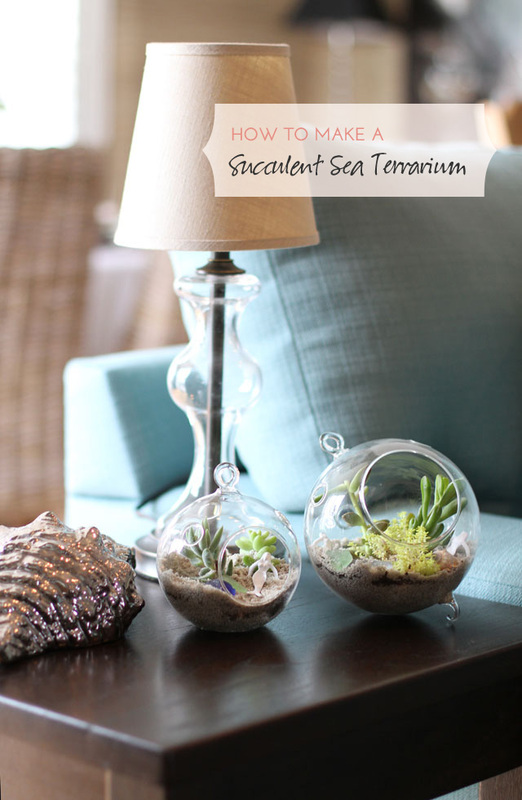 Thus, the succulent sea terrarium craft was born. 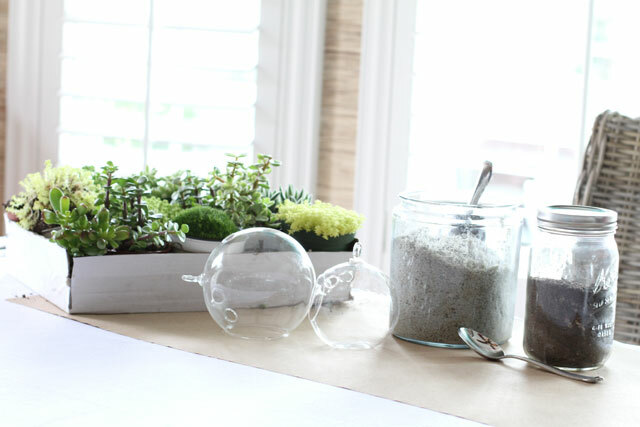 The kids terrariums came out so pretty that I had to create a few “grown up” versions for myself. 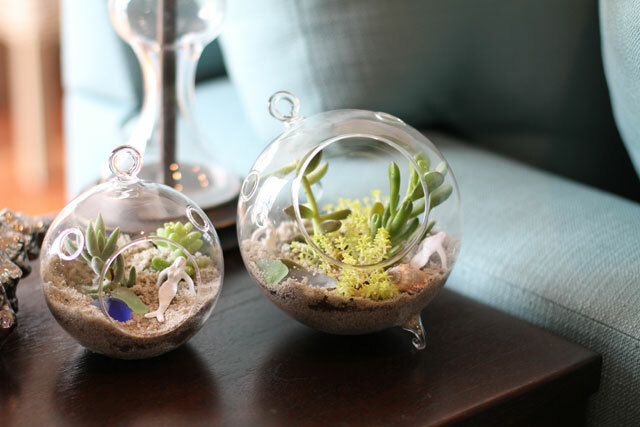 I chose succulents as the focal point in the terrariums because even though they are really dry, desert dwellers, their shape and color also remind me of algae and seaweed you would find in the ocean. I selected tall, spiny looking succulents for the arrangements, with a few grass-like ground covers as well, to represent algae. The glass globes were picked up at a local craft store and although they are technically meant to be votive holders, their shape remind me of old glass fishing balls. In addition you will need some coarse sand and cactus soil. 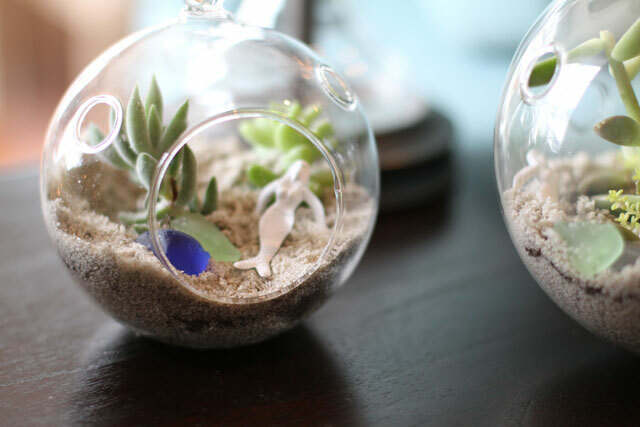 I wanted the terrariums to have a sandy soil to mimic the bottom of the ocean, however since succulents need some kind of organic rich soil, they most likely would not survive in pure sand. So I created a sandy bottom with a little crater for some cactus soil to rest in. We, well mainly my husband, has been growing succulents for over 10 years now. He likes to claim that he loved succulents before they were cool. All this to say that we’ve had a lot of experience growing, and sometimes failing at growing succulents. We started out using regular potting soil, but have found that the more arid cactus soil works much better, allowing good drainage and circulation for the succulents. So once you’ve laid out your sandy bottom and base of cactus soil, you’re ready to start planting. The nice thing about working with succulents is their shallow root system and how little soil they really require to survive. If some of your plants are a bit too large for your vessel, you can simply trim off a bit of the root or some of the leaves and stick them right in the soil. I’ve read that dipping your succulents in a rooting hormone before planting helps encourage growth, but I’ve never used it and have always had great luck. It’s always an option though in case you’re a little nervous. Once you’ve got your planting done, gently add in a bit more sand to cover up the cactus soil. It doesn’t have to be perfect, in fact I think it looks quite nice having a bit of the soil peeking through the sand. If you wish you can add a little mermaid or two, and some pretty rocks or shells to complete your seascape. The miniature mermaids are actually cocktail drink markers I found online and spray painted them white to be a bit more sophisticated. The final result is pretty little terrarium that combines my daughter’s love of all things mermaid related, my husband’s love of succulents, and my love of good design. 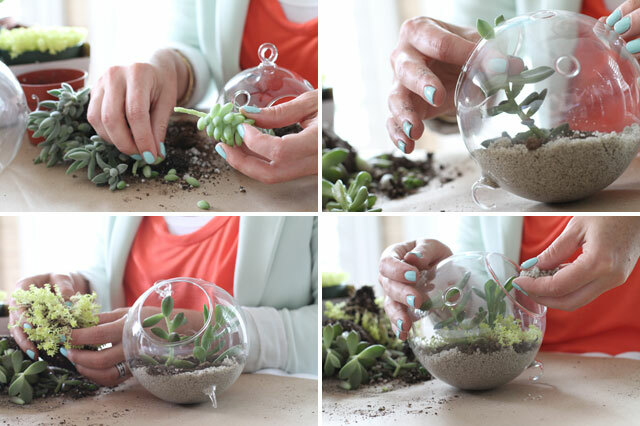 To care for your succulents, simply add just a touch of water every other day for 2-3 weeks to get them started. After that, a light watering once a week should do the trick. In small vessels like this I’ve had my succulents last for at least 9 months, but of course play it by ear and know that you may have to refresh your plantings every once in a while. 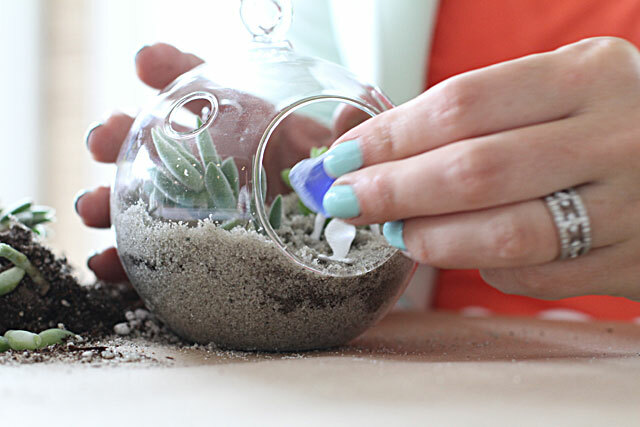 Succulents are easy to care for, but they’re not completely maintenance free. If they do in fact grow you will have to transplant them. And in case you’re interested, for the kid’s terrariums we used quart size mason jars for the vessels, and I left the mermaids their original color. We set the table up outside and let them each create their own fantasy mermaid world, and they loved packing their jars with as many shells, stones, and brightly colored mermaids as they could fit. I thought this was such a great idea for a kids party when I read about it on your blog, but I especially love how you’ve made it sophisticated for adults, too. 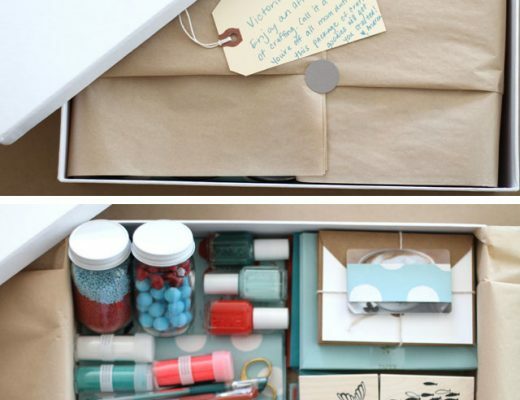 Perfect craft for a party – love that you thought about something that wasn’t just more “stuff’ for the kids to drag home and never look at again. Can I come to the next one? Gorgeous! This is definitely a craft project I would want to bring home and display! Are you aware that using beach sand is dangerous for the plants because of the salt in beach sand. 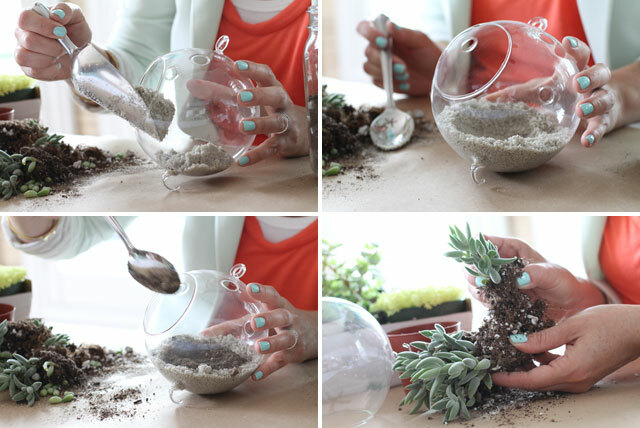 Use regular sand like from a construction site. What is that nail polish!?!? I MUST have it! Essie Mint Candy Apple :) I love it sooo much! NICOLE, would it be possible to have some kind of icon or something else near the top denoting that certain posts are guest posts? I know it says “by Andrea” but my eye kind of skims over the small pink type. It’s a bit jarring to read a post expecting it to be by you and then hit something that makes it clear it’s not actually you. Andrea, they turned out gorgeous!! 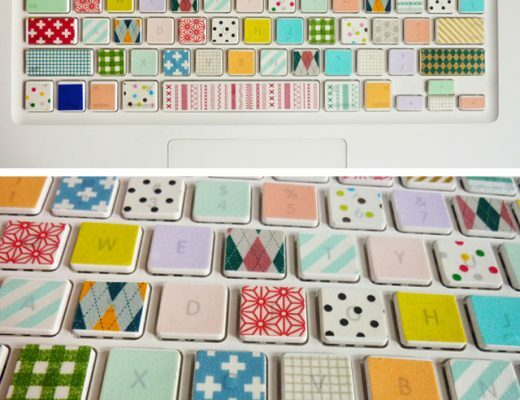 This is the most fantastic craft idea! So fun, but still something that won’t just be trashed once the party is over. That’s fantastic — I’ve always wanted to throw a mermaid party :) P.S. Your nailpolish is AWESOME! thanks Brittany :) It’s by Essie – Mint Candy Apple. is turning 26th still acceptable for having a mermaid themed birthday party? Also, I am totally digging the color of your shirt + the color of your nail polish! Andrea, where is your ring from? It is gorgeous! Awww, thank you so much! It’s by jewelry designer Kwiat and my husband got it at Nordstrom 3 years ago for our 10 year anniversary. I wear it now in place of my wedding/engagement ring. Thank you. I am always looking fro Earth Day Projects. This is a really good one. Wow! 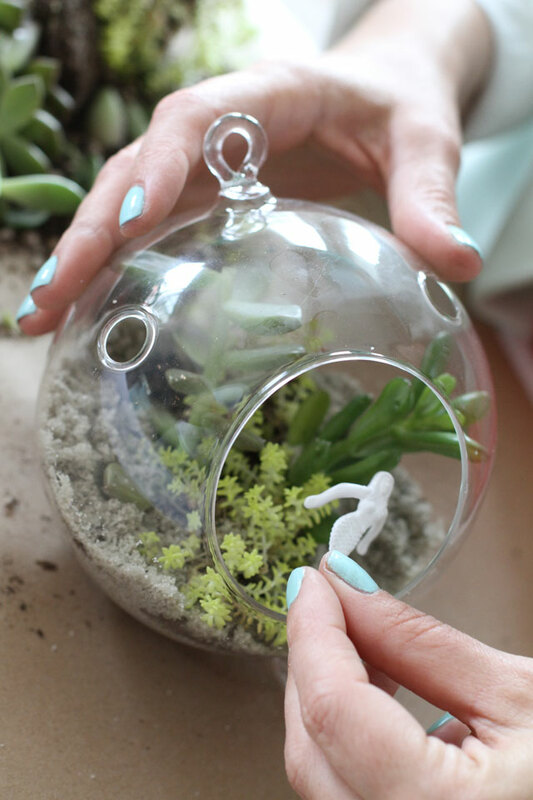 These are beautiful little terrariums. Thanks for the great tutorial. An outstanding share! I’ve just forwarded this onto a friend who has been doing a little research on this. And he in fact ordered me breakfast simply because I discovered it for him… lol. So let me reword this…. Thank YOU for the meal!! But yeah, thanx for spending time to discuss this issue here on your site. A softly watchfulness Once worn, the 358 is paradoxically a soft watching : the 47 mm of diameter enables a enormous apportionment from the 170 grams of weight (that is agreeable to reason regarding how big the horologue, because of the titanium). Enhanced animate is herculean, especially if it’s decayed about the left clutches since the crown defence doesn’t press about the wrist. Just the thickness can shrink but tribe get familiar to it expeditiously. The readability is ideal in each and every locality because of the soberness from the dial and also to the clutches which are generously covered with Super Luminova. Panerai Luminor Watches The flexure bezel is incomplex to sway. The clicks are unswerving and tight. It exudes firmness. Another thong, intellectual for the diving As some brave proprietor will maybe go dabbling some octopuses or sun rays with this particular rigorous toy, Panerai provides another special diving nylon corporeal thong on the clasp that can take in the lever cause from the diadem safety. Well meditation, it appears of the certain firmness and enables modifying the size of the strap to every millimeter, that is convenient when putting on diving suite. Deduction To bring into proximity a deduction, this part doesn’t inadequate arguments. It’ll please both brand fanatics that need to have an excluding bit, too for the amateurs of utmost diving watches who definitely are lured by its stainless manufacture.